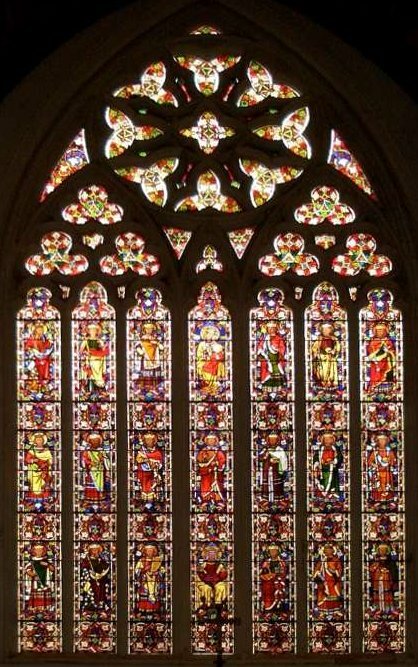 According to Peter Cormack, this was the "first window to be installed in the church, probably within approximately a year of the building's completion (1848)." It was designed by Pugin himself, perhaps in collaboration with the church's architect, Richard Cromwell Carpenter. The cartoons were drawn by Francis Wilson (Frank) Oliphant, cousin and husband of Margaret Oliphant the novelist; Oliphant had previously been the chief designer for William Wailes of Newcastle, but was now working for Pugin. The window has "three tiers of crowned figures with, in the upper part of the centre light, the Christ Child seated on his Mother's lap," with the vine motif (for the stem of Jesse symbolism) woven into the geometrically patterned borders around the figures; its "colouring is rich and the design hieratic in conception, evoking the spirit of the best Gothic glass without imitating any specific prototype" (Cormack). Stained glass design is a relatively under-recognised aspect of Pugin's achievement, although Rosemary Hill says that just around this time, "It was the only part of his practice where demand was increasing and the one that engaged his interest most, after architecture" (420). Cormack explains that Pugin revived the medieval principles of stained glass art, encouraged John Hardman to make the art a part of his ecclesiastical metalwork enterprise, and personally designed most of the stained glass that Hardman turned out. This made Pugin the most significant figure in this area up to the mid-1850s. Finally, Cormack (who edits the Journal of the British Society of Master Glass Painters, and is Deputy-Keeper of the William Morris Gallery) believes this complete set of Pugin windows in an Anglican church to be "probably unique," and the East window itself to be "one of the finest early Victorian windows in the country." Note that, in or after the 1860s, taste had changed so much that the window seemed too brilliant. Fortunately, on G. F. Bodley's recommendation, the glass was toned down by over-painting instead of being removed and replaced. It has since been restored to its original brightness. Cormack, Peter. The Artistic and Historical Importance of the Stained Glass Windows at St Paul's Church, Brighton. Brighton: St Paul's Brighton Parochial Church Council, rev. ed. 2002 (no pagination). Hill, Rosemary. God's Architect: Pugin and the Building of Romantic Britain. Harmondsworth: Penguin, 2008.